Zakir Hussain is today appreciated both in the field of percussion and in the music world at large as an international phenomenon. 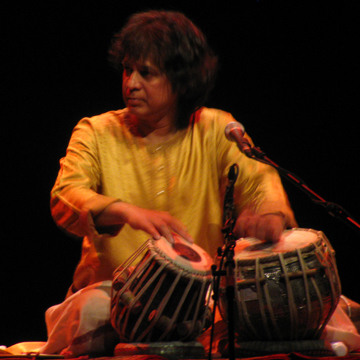 A classical tabla virtuoso of the highest order, his consistently brilliant and exciting performances have not only established him as a national treasure in his own country, India, but gained him worldwide fame. His playing is marked by uncanny intuition and masterful improvisational dexterity, founded in formidable knowledge and study. The favorite accompanist for many of India's greatest classical musicians dancers, he has not let his genius rest there. Widely considered a chief architect of the contemporary world music movement, Zakir's contribution to world music has been unique, with many historic collaborations, including Shakti, which he founded with John McLaughlin and L. Shankar, Remember Shakti, the Diga Rhythm Band, Making Music, Planet Drum with Mickey Hart and Tabla Beat Science.